Recent advances in Loss-In-Weight technology make it possible to control solid fuels flow with high accuracy, excellent dynamic properties and relatively low cost. None of the current technologies offer such a combination. Increasing fuel costs and environmental concerns sharpen the demands on indirect fuel metering systems. For small to medium sized furnaces, owners look to coal or petroleum coke to lower fuel cost. Pulverized coke or coal is hard to handle. Power generation plants typically meter the fuel flow going into the pulverizer for that reason. For a small furnace this is not practical, partly because of dynamic considerations, partly because of the high cost of having several pulverizers on-line. The following presentation describes new technology for high-accuracy, fast-response fuel control using Loss-In-Weight methods. Coriolis and Impact devices must be combined with a feeding device to be able to control the feedrate. Rotary Disc, Belt and Loss-In-Weight feeders have built-in feedrate control by design. The poor accuracy of Impact, Coriolis and Rotary Disc feeders can be improved with different in-stream calibration devices, all employing a weigh hopper somewhere in the fuel flow. Weigh Belt feeders appear attractive, but there is a material handling problem with the extremely floodable pulverized fuel when starting and stopping the feeder or at drastic changes in the fuel flow. The “usual” requirements still apply, such as Zero Cost, Requiring no space, 100% availability, easily fitting in to the existing design, etc. Loss in weight metering is based on a weigh hopper with an attached controllable feeding device, such as a screw. In normal operation, the feeding device extracts the fuel out of the weigh hopper, and the feedrate is measured by calculating the loss of the weight in the hopper. Eventually, the hopper has to be filled up. This is done as quickly as possible, since it is impossible the measure the weight loss during the fill cycle. equals the setpoint. To get a measurable change in the weight, the time period must be substantial. This produces a slow system. A “real” change in the feedrate is not detected immediately. The PID parameters used to tune the controller must be setup for the slow reacting measurement. The effect of this is a very slow response to changes in the set point. Any disturbances of the weight value greatly upsets the PID controller. To reduce this effect, low pass filtering is used. This further aggravates the response time problem. The controller screen snapshots below illustrates the effect of a weight disturbance and a setpoint step change using legacy control. Effect of 10 s feeder failure – 30 s recovery Setpoint step change – 40 s response time Considering the requirements above, this method is unacceptable. 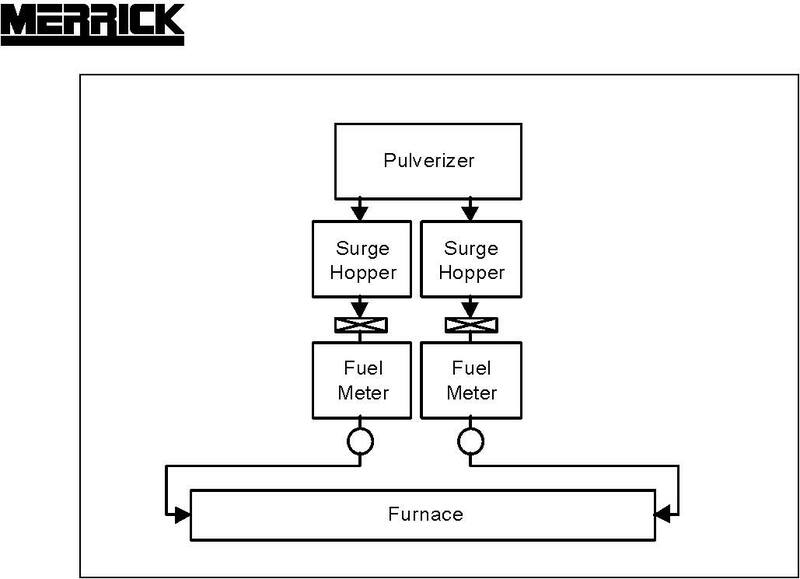 In many older installations, this method has been abandoned in favor of volumetric control, where the feeder speed is adjusted directly by the furnace control system, and the Loss-In-Weight controller is used only to produce a somewhat delayed feedrate value. With the introduction of advanced programming techniques and microprocessors fast enough to handle serious real-time calculations, new control algorithms have become available. By evaluating the credibility of the weight signal, it is possible to let two or more control algorithms compete for control. When the Setpoint and Feedrate both are at steady state, legacy PID control is hard to beat. At setpoint changes or weight disturbances, a mathematical model of the feeding device is more useful. continuously and automatically updated. Naming the two methods PID and CSG (Conditional Step Gravimetric), we can let them compete for control based on the stability of the setpoint and feedrate. 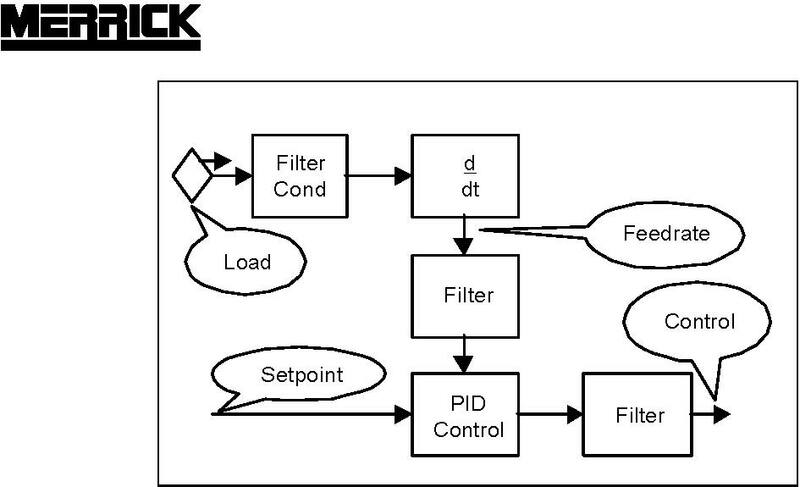 In steady state PID is the dominant controller. In less stable conditions, the CSG takes over gradually. None of the two ever takes complete control. The CSG parameters must be continuously refreshed. 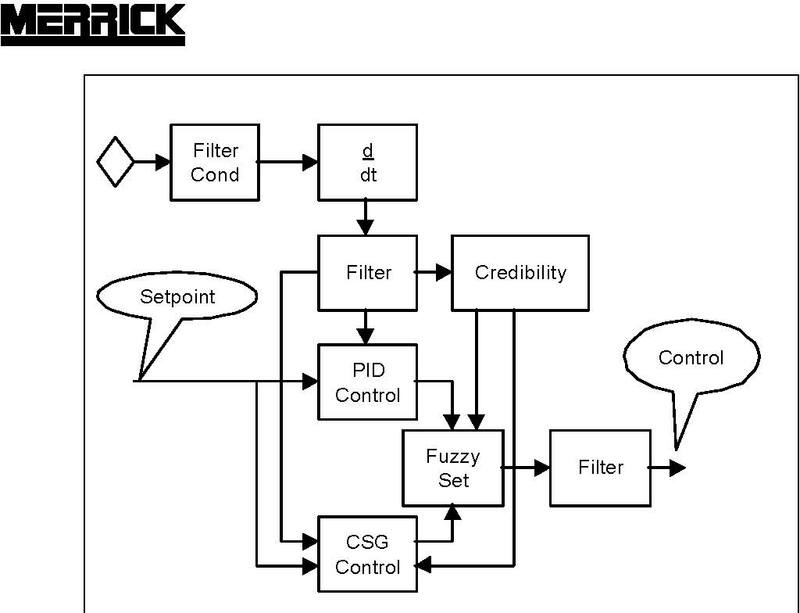 This happens when the PID controller dominates, and the dynamic values have a high degree of credibility. The controller screen snapshots below illustrates the effect of the same weight disturbance and a setpoint step change as above. Notice the improvement in the response time. feeders were retrofitted with a new control system, consisting of a Merrick MC³ Multiple Algorithm Loss-In-Weight controller and an Allen-Bradley PLC. The feeders have been in operation for 100 days. So far, the results are promising, and it was possible to improve the overall furnace control substantially.